Did you know that four fifths of the salt you consume every day is already in the foods we buy. 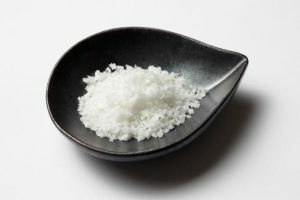 The recommended salt intake of adults should be no more than six grams per day, to help reduce the risk of cardiovascular disease which can bring on high blood pressure. What are the implications of excess salt intake? On average people are consuming two grams more salt per day than the recommended maximum amount, which equates to eight grams per day. It might not sound like a lot, but it is estimated this is causing thousands of premature deaths every year. This is because excess salt leads to high blood pressure which is one of the main causes of premature death of adults in the developed world. The first thing you can do is cook with less salt. Make use of black pepper as seasoning instead of salt. 75% of the salt we consume is already in the foods we eat, such as bread, breakfast cereals and ready made meals. Remember when eating in or out, don’t automatically salt your food. This is mostly out of habit, try the food first. When shopping for food look at the salt content and shop for lower salt foods. When buying canned vegetables go for the once’s with no added salt. If you are eating out or ordering a takeaway you can still reduce your salt. If ordering Pizza choose vegetable or chicken toppings instead of pepperoni or bacon. Don’t go for extra cheese. Burgers; have your burger without extra bacon and cheese and instead go for salad as topping, you will be surprised still how good they taste. Indian or Chinese, go for plain rice rather than egg fried or pilau and they contain much less salt. Sandwiches – Rather than ham or cheese try fillings like chicken, egg or vegetables. Try reduced fat mayonnaise instead of mustard which normally has much higher salt. With just a bit of effort you can cut down your salt intake which will be good for your health.